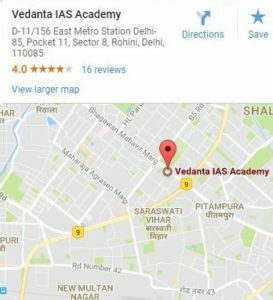 In vedanta ias academy rohini Admission procedure, you are requested to apply for Regular Foundation Batches Download Admission Form along with two recent passport size photographs, 10+2 Certificate and Photo ID Proof (Aadhar Card/Voter-ID/Pan card/DL/Passport). Otherwise, Submit Hard Copy at Any Branch of Vedanta IAS Academy. Admission procedure on First-come, First-served basis. Specially 25% Discount for First 100 Students. Payment should be made either in Cash/Credit Card/Cheque/Debit Card (Master/Visa)/DD in favour of Vedant Institute PVT.LTD. , payable at Delhi. You can Download fee-receipt in Case of Pay Online . Account Holder’s Name: Vedant Institute PVT.LTD.